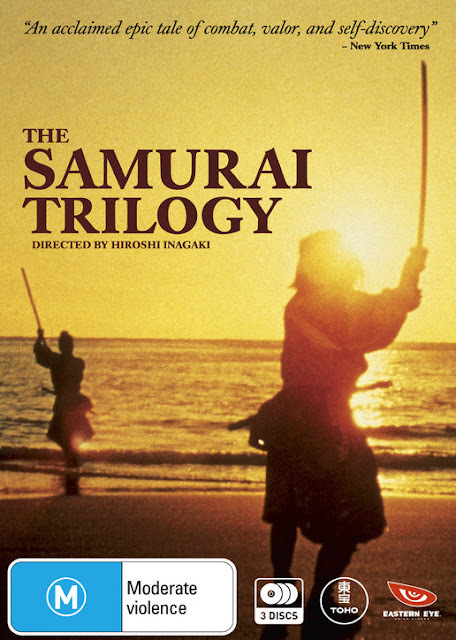 Hiroshi Inagaki's The Samurai Trilogy (1954-1956): five hours of cinematic groove divided into three movies revolving around the adult life of Miyamoto Musashi (circa 1584-1645), author of The Book of Five Rings, artist and winner of sixty-one (or more) sword duels, played by Toshiro Mifune (1920-1997), and based on the thick Musashi novel by Eiji Yoshikawa (1892-1962). We are immersed into 1600s Japan, codes of ethics, social systems, gender roles, Buddhism, philosophy, art, meditation, and death by sword-play. Musashi's character and skill develops as things move along, and look for the women, too. A sprawling epic that let's us flow along with its varying tempos. Hiroshi Inagaki's The Samurai Trilogy (1954-1956). In it, many die by the sword, but only "Moderate Violence" -- or so says the cover of this DVD. 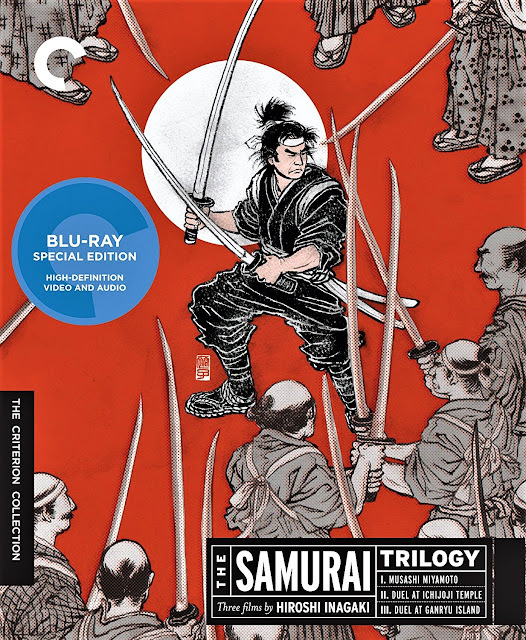 I, II, III: Musashi Miyamoto (1954), Duel at Ichijoji Temple (1955) and Duel at Ganryu Island (1956). The accompanying music by Ikuma Dan (1924-2001) adds to the pacing of the film. For about twenty seconds of the overture, you can catch the first inklings of Ennio Morricone's "Ecstasy of Gold" in the main theme. (See Sergio Leone's Il buono, il brutto, il cattivo / The Good, the Bad and the Ugly, 1966).